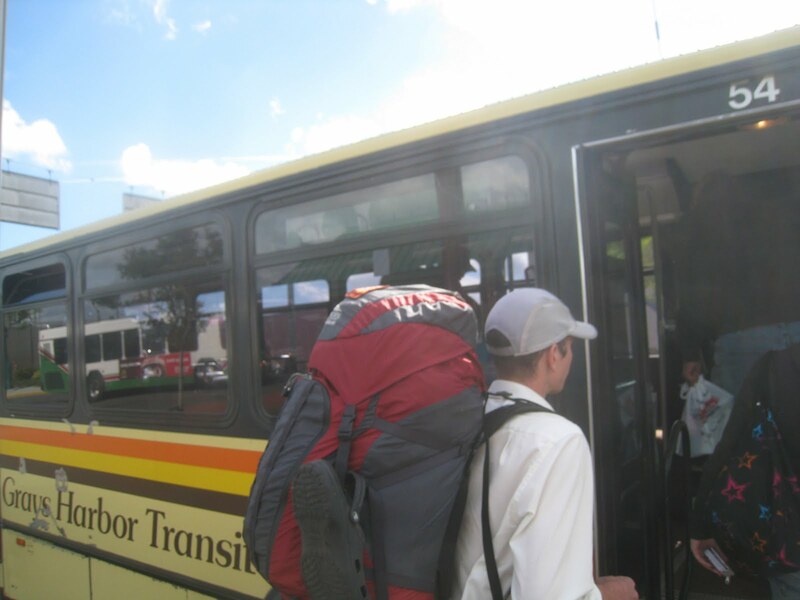 This blog has often covered transit-accessible hikes that can be accomplished in a day. But many of the most beautiful areas of Washington are out-of-reach of the day-hiker — even one who relies on a personal vehicle to get them to the trailhead. This summer, two of us set out to see if we could use transit to reach some of these more remote destinations. The result was an eight-day excursion that brought us from downtown Seattle past our State’s capitol, through the heart of Olympic National Park, over international waters to Victoria BC, and home, relying entirely on public transportation and our own feet. The trip started with a five-leg transit journey from Seattle to Lake Quinault Lodge, on the south-west edge of Olympic National Park. The following is a weekday itinerary: the trip is possible on a weekend, but transfers don’t work out quite as well. 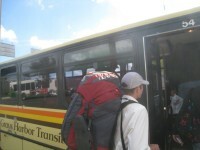 The itinerary above worked out perfectly for us: the short transfer times were a bit worrisome (the latter two buses run only a few times each day) but we faced no significant delays. Our bus from Olympia to Aberdeen was running about 15 minutes behind schedule: we were a bit concerned at first, but were reassured when the driver got on the radio to make sure drivers of other routes would wait for connecting passengers. The route 60 to Quinault Lodge is probably one of the most beautiful (and cheapest) public transit rides that exists. It travels up the narrow two-lane highway through hills dense with trees, dropping passengers in unlikely locations where they proceed on foot up rutted dirt roads. Our destination, Quinault Lodge, was much more obvious. We arrived at 12:35 on the dot, still amazed that a $1.00 bus ride could take us 45 miles and right to the south-western edge of Olympic National Park. The ranger station is steps from the lodge: after obtaining our back-country permits ($5.00 plus $2.00 per person per night, no reservations required) and bear canister ($3.00 suggested donation), we were ready for the hike. The main trailhead is 14 miles past Lake Quinault up a dirt road. There is a private shuttle service available (for information, contact the ranger station: 360-565-3100), but we were preparing to hike it when a father and son with extra room in their pickup offered to drive us the first ten miles. We gladly accepted and chalked it up as carpooling, an acceptable alternative to transit. From the North Fork Trailhead, the trail lazily meanders up the north fork of the Quinault River for about 17 miles. The first day we hiked late into the evening under the cedar trees, catching glimpses of deer in the dense brush and even an owl hidden among the branches above us. The second day took us over the 3600 foot Low Divide between the Quinault and Elwha rivers. The climb over the divide is short but intense, offering glimpses of sunny meadows and an impressive waterfall before the trail descends again into the trees of the Elwha river valley. By the third morning, we had reached the Hayes River Ranger Hut, just 16 miles from the Whiskey Bend trailhead to the north down the Elwha river. Continuing down would have enabled a shorter trip, but we chose instead to turn east and head up the Hayes Pass trail. This opened us up to three days and 35 miles of hiking through colorful alpine meadows sliced by clear streams, cresting high passes with views of Mt. Olympus, sliding down late-summer snow fields, and spending nights in the crisp air of the higher elevations. Our trail took us over four steep passes: Hayes pass, Lost Pass, Cameron Pass, and Grand pass. The extra miles and difficult trails were well-worth the added effort: this is some of the most beautiful back-country either of us have experienced, and three days to stroll through it was far too short. By Friday morning, we reached the Obstruction Point parking lot, and opted to hike the eight-mile dirt road toward the Hurricane Ridge Visitor Center. The road follows the ridge-line, and offers clear views south toward the glaciers of Mt. Olympus and the high terrain we traversed during the week. The normal visitor to Hurricane Ridge arrives via the winding 17-mile highway from Port Angeles. No public transit yet exists on this road, but the alternative — a steep ten-mile trek around Mt. Angeles, over Klahhane ridge, and down past beautiful Lake Angeles — would be worth a trip in itself. We hiked the first part of this on Friday evening, and spent our final night in the park at the edge of Lake Angeles, under this summer’s only blue moon. The trail down from Lake Angeles ends at the park entrance gate, where one must walk, hitch-hike or (as the helpful ranger suggested) call a cab for the final six miles into Port Angeles. We opted to walk the distance (part-way along the road, part-way along the Peabody Creek Trail) to the Wilderness Information Center in town, where we returned our well-used bear canister. Other endpoint options include exiting the National Park anywhere on Highway 101 to the north or northwest and flagging down the Clallam County Transit route 14, which runs from Forks to Port Angeles and will stop to pick up riders almost anywhere that is safe and visible. From Port Angeles, it is possible to return to Seattle via transit connections to Port Townsend and then a multi-agency Sea-Tac route promoted by Jefferson County Transit [pdf]. For the sake of the other riders during the 3.5 hour trip, grab a shower at the William Shore Memorial Pool in Port Angeles: they charge just a few dollars for the privilege. Another return option is to take the Dungeness Line, a private shuttle from Port Angeles to Sea-Tac, with stops along the way, albeit at a much higher price. Finally (and at significantly greater cost), you can choose to head to the water and catch the Coho ferry to Victoria, followed by the Victoria Clipper back into Seattle. Passports are required, and reservations are strongly recommended on the Clipper. We chose the latter option, meeting a friend for two pampered nights in downtown Victoria, where we gave our blistered feet a much-deserved rest while enjoying Victoria’s beautiful views, historic sites, incredible food and wine, and the free outdoor music of the Vancouver Island Blues Bash. We set foot back in Seattle eight days after leaving, having ridden four buses, a train, two ferries, and having walked 85 miles through some of the most beautiful mountains in the world. Can we see more pictures? Elbar: ST 510 to Everett, SKAT 90X to Mt. Vernon, Island transit 411 to Anacortes Park and Ride, SKAT 410 to the ferry. Leave downtown a bit before 7:00, get to the ferry dock at 9:35. A lot cheaper than a Greyhound, too. If you’re willing to spend a bit more, you could take the Cascades to Mount Vernon. That’s great that Jefferson Transit put together a PDF to make sorting out the trip to PA easier to figure out. I used to do it a decade ago with some regularity, but I cobbled my plan together with paper schedules. Both 3:40 trips have alarmingly close connections, but I never had any problems–tell the bus driver what you’re trying to do and (within reason) they’ll make sure other buses hold. Speaking of beautiful rides on public transit, Jefferson transit will also take you to that trailhead, through Forks, but along a beautiful stretch of Oceanfront. (Clallam transit runs a Port Angeles to Forks route.) The Quinalt reservation also runs a bus that connects this trailhead to Forks and Grays Harbor, but also Ocean Shores. Starting October 8th, you could extend the second leg and take the Sounder all the way to Lakewood: the 603 picks up there as well. Sounder does not make any reverse commute trips to south tacoma or lakewood sorry to say. This is incredible. In planning my move back to Seattle, I have been under the impression that remote areas were essentially inaccessible by public transportation. I’m an avid hiker/backpacker, so I thought I’d have to own (or rent/ZipCar) a car to enjoy the wilderness. If you search for “transit hike”, you’ll find Zach’s other contributions to the series. has turned me on to a lot of hikes I had no idea I could access by bus. The Olympic Peninsula is ringed by rural transit service. Geometrically, it’s relatively easy to provide lifeline service, as there’s basically one main road and almost every town is on or near that road. The I-5 corridor is similarly fairly accessible. The Cascades and eastern Washington are much more challenging, and I’ve yet to figure out a good way to get around which doesn’t involve a car. (My idea of “good way” excludes riding a bike on the shoulder of a major highway). Yes, the Cascades are much harder, especially since CT and SKAT cut back on service to places like Darrington and Marblemount. 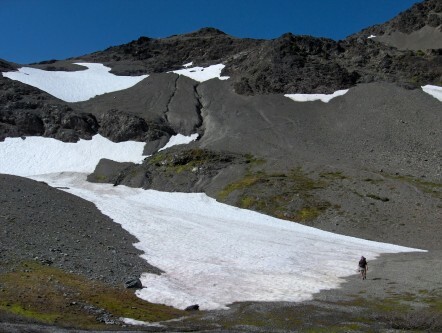 Even so, the best transit hike on my bucket list is Stevens Pass to Stehekin via Glacier Peak and the PCT. Trailways to Stevens Pass, walk 100 miles to High Bridge, take the Park Service shuttle to Stehekin, take the Lady of the Lake to Chelan, LINK Transit to Wenatchee, and then the Empire Builder back to Seattle. 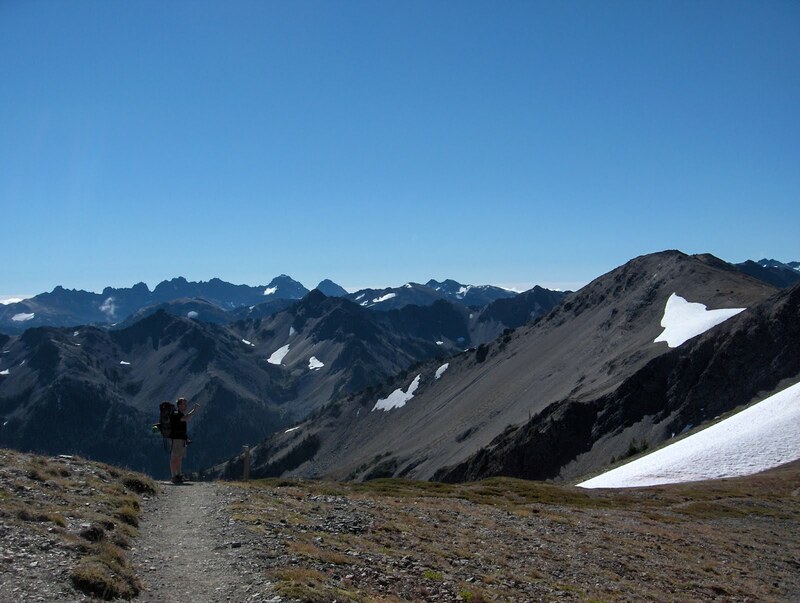 Doing that in about 8 days would be ideal, and Glacier Peak is not to be missed! I hiked 35 miles from Holden Village to Image Lake to Stehekin in 2008, and it’s still the hiking highlight of my life. I did Rattlesnake Ledge car-free once, but that required biking down the Snoqualmie Valley trail from at least North Bend. (In actuality, I also did Issaquah->North Bend one way on top of that). 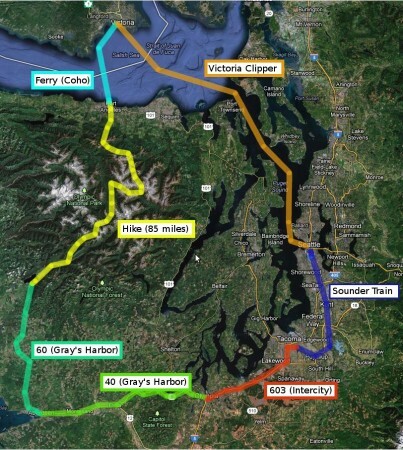 By connecting to the John Wayne Trail, you could potentially access the entire I-90 corridor with nothing but transit and a mountain bike, if you have enough time. 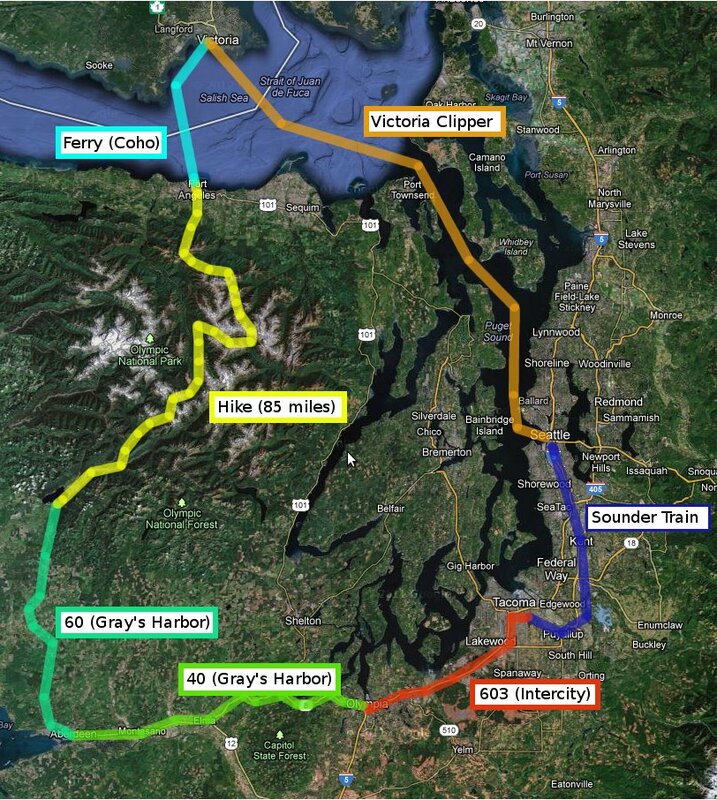 One trip I’ve imagined doing, is to take Sounder to Puyallup, then bike to the Carbon River Ranger Station for Mt. 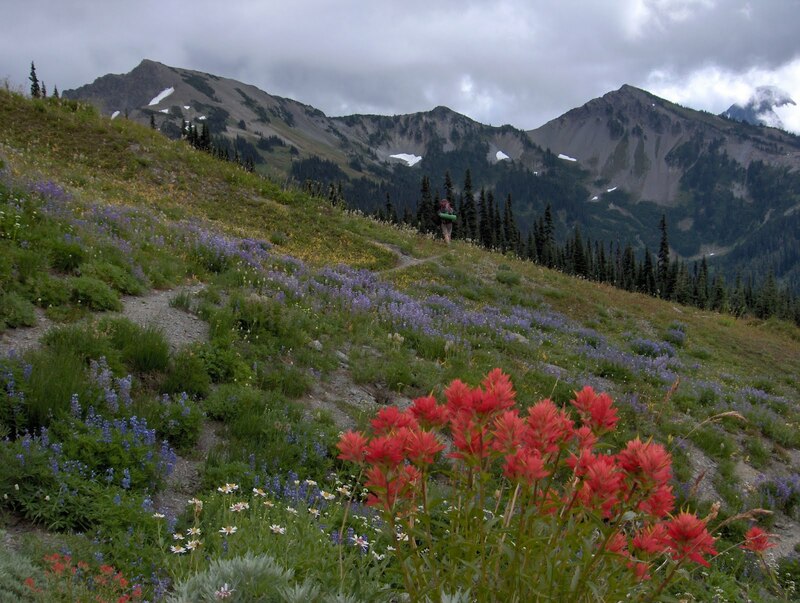 Ranier National Park (about 35 miles), then start hikes from there. Never actually did it, though. Most likely, it would be done as a 3-day trip – one day to get to the trailhead, one day to hike, one day to get back home. I’ve done this from Auburn – you can get in a good hike up to the Carbon Glacier. Good training ride for the STP too. Twice, I’ve done the full Rattlesnake Mtn trail by bus to North Bend by hiking a 21 mile loop: 7 mile Snoqalmie Valley trail to Rattlesnake Lake, then 11 miles along Rattlesnake Ridge to Snoqualmie Point, then 3 miles back to North Bend via road. Just right for a full day, but too bad there’s no bus stop at Snoqualmie Point. I’ve also done the Stevens Pass to Stehekin backpack (PCT alternate) in 6 days, using bus and boat. Want to repeat this one. A month ago I did the PCT from Cascade Locks to McKenzie Pass in about 8 days, using Amtrak to Vancouver and back from Eugene, plus local buses (Clark & Skamania Counties) from Vancouver and an easy hitchhike from McKenzie Pass. In similar fashion I’ve hiked the PCT from Yosemite (you can book to Tuolumne Meadows via Amtrak) north to the Oregon border and from Yosemite south to Walker Pass, each with a short hitch hike at the end before reaching local buses and eventually Amtrak. With a car and bicycle, I’ve done a lot more “hike-n-bike-n-bus”. Need to get Greyhound to stop at Snoqualmie Pass. To date, I haven’t do the rattlesnake traverse car-free, but I’ve thought a bit about possible ways to do it. One option would be to take the Snoqualmie Casino bus from downtown Seattle to the casino (it’s a private bus run by the casino, I think it’s a $10 fare, which includes a $10 gift certificate to their restaurant), then walk 1.2 miles from the casino to the western trailhead. From the eastern trailhead, you could walk the snoqualmie valley trail to North Bend or, if 20 miles in a day is too much, I’m guessing the huge popularity of that trail would make it easy to hitchhike at least to a #209 stop at North Bend, if not all the way to Seattle. Another option that would avoid the need to hitchhike would to a bike keyswap. Basically, you go with a friend and each ride the 209 to the Snoqualmie/North Bend area with bikes on the rack. Then, you each ride your bikes to opposite trailheads, lock your bikes to a tree or something and start hiking in opposite directions. When you meet in the middle, you exchange keys so you can unlock the other person’s bike at the end of the hike, then ride his bike to some central meeting point where you can grab food (e.g. North Bend Bar & Grill) and catch the bus back home. Of course, due to the limited bike rack capacity on the Metro buses, you would need either folding bikes or enough spare energy to do the very hilly ride from North Bend to Issaquah if you have to. See, this is exactly the type of ride they should have using buses. This would then reduce all the car traffic to Rainier if there were buses from a major Sounder Station to the popular trail heads. I like the idea of buses to Mt. Ranier, but I’m not sure a Sounder station is necessarily the best place to connect at. Many more people visit the national park on weekends, but the Sounder only runs on weekdays. Nevertheless, the ST 594 bus already takes you halfway from Seattle to Ashford and there is already a park shuttle to get from Ashford to Longmire and Paradise, so it would be really nice if there were some service to fill in the 47 mile gap between Lakewood and Ashford. The problem, of course, is finding money to pay for it. Both ST and NPS have higher priorities to spend their limited funds, and I don’t think the economics pencil out for a private operator either. Most people go hiking in small groups, rather than alone. And, as long as buses have to have human drivers, any fare that is high enough to pay the operating costs would be high enough so that for a group of 3, driving would be substantially cheaper than riding the bus provided just one person in the group had a car. Even nobody in the group was a car owner, renting a car and splitting the cost 3 ways would likely still be cheaper than the bus (with Zipcar, each person’s share would be roughly $30-35 if you include both the car and the park entrance fee). In the long run, when we can invent a transit bus that can be driven by a computer, with no labor costs, then we should be able to have regular service between Lakewood and Mt. Ranier that would pay for itself with fare revenue. Until then, though, I just don’t see it happening. In the meantime, a bike route to the park entrance that avoided the high speed heavy traffic on highways 7 and 706 would be really nice. it would be really nice if there were some service to fill in the 47 mile gap between Lakewood and Ashford. Timely. A new bike rider at work was just asking me about rides in the NW. Seems Cascade is attempting to perpetuate a culture that if you don’t sign up for their rides you are SOL. One of the alternatives I suggested was the start from Ashford and making the loop from Logmire over Paradise and back via Skate Creek Road. Not going to happen with transit but a carpool would totally work. Been there done that; the van seats seven and Fluffy can carry the same number of bikes. From PT it’s a two- or three-seat ride to Port Angeles (depending on the time of day, and/or whether you use the #11 shuttle or walk from the waterfront to Haines Place). It’ll get you there faster than going through Bainbridge and much cheaper than going through Victoria. I had quite a good ride this morning when I made use of a few ferries, including the test ferry between Seattle and Bremerton. I can see the Port Townsend ferry bringing about some serious bicycling adventures in the future. What a great trip. If you haven’t already, you might consider posting a copy on nwhikers.net. I’m sure a lot of hikers there would love to read about this. My personal fantasy is that they will someday run a passenger ferry from Seattle to Port Angeles. Then run a bus from there up to Hurricane Ridge. This would be really popular with day hikers, backpackers and (backcountry as well as lift riding) skiers. As it is, this area is not really well served. I would settle for quick buses timed with the ferries. I looked into it last year, and it just didn’t pan out. I wanted to go for a day hike to Hurricane Ridge on a weekday. My friend wanted to join me. He lives in West Seattle, while I live around Northgate. He can take a bus to my house, but it just takes too long. Driving through Seattle is just as bad. I could be a passenger on a ferry, and have him pick me up on the other side. However, this means quite a bit of backtracking. I looked into taking a bus from the ferry to a better spot (Hood Canal would be ideal) but they are too slow and too infrequent. We ended up both driving onto the ferries and carpooling from Hood Canal. Less than ideal, but much faster than the alternatives. The national park service already operates shuttles from Longmire to Paradise, so a shuttle from Port Angelas to Hurricane Ridge would not be unprecedented. I think what it would ultimately take to get it to happen is large enough crowds so that the Hurricane Ridge parking lot becomes chronically full. That way, someone could make the argument that operating a shuttle service may be cheaper than expanding the parking lot in an area at the top of a mountain with almost no room to expand the parking lot. Last time I went to Hurricane Ridge the parking wasn’t that bad, but the line to get through the main entrance was pretty long. I’d support a shuttle on that basis alone. NPS also runs shuttle buses in several of the more crowded national parks, like Rocky Mountain. If there is a shuttle, it had better have some way to bypass the car line at the entrance – otherwise, the length of the line gives you zero incentive to ride the shuttle. 3 minutes to transfer from the 18E to Sounder! I am glad that your faith in Metro paid off. Well, even if he missed the Sounder, he wouldn’t have been screwed. There was probably a 594 coming just a few minutes later. Worst-case, even the 7:30 Amtrak might have worked (taking it all the way to Olympia), but it would have cut the connection in Olympia a little close. I haven’t checked the schedule of the IT bus between the train station and downtown Olympia, but I’m guessing the Amtrak option would have required a taxicab for that stretch in order to catch the bus to Aberdeen. Correct. We had originally intended to make the transfer to the 594, but Jake had never ridden the Sounder, so we made the change last second because the timing was perfect. Any interest in starting up a meetup group for transit hikes? It would a great way to introduce people to such trips. I’m not yet in the area, but I’d definitely be interested. Is there a resource (like a website) that catalogs destinations and transit pathways (like in your table above)? If not, that sounds like a fun and useful project I’d like to work on. Not exactly hikes but epic transit journeys nonetheless. I would join that group. what’s a “bear canister” ? It’s a firm metal canister to keep your food away from hungry bears (and mice, for that matter.) When I was hiking with the Boy Scouts, we’d usually put our food in a bag up in a tree, but a can’s another option. There are also metal mesh bear bags that hold off a bear, but not a rodent. I use an “Ursack” that weighs a lot less than a bear canister and is much less bulky too, though it’s not quite as fool proof. I use it all the time, because it also keeps out rodents. Just gotta say, this is very cool! Sounds like you guys had a blast. It must be awesome to travel all that way, and to such remote places, without ever having to set foot in a car. I imagine that minus the car it makes it feel like even more of an adventure.